There’s less than ten days left in 2016 and many of us now completing our plans for New Year’s Eve. 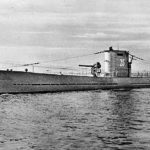 Many of us are also starting to contemplate our resolutions for the New Year. 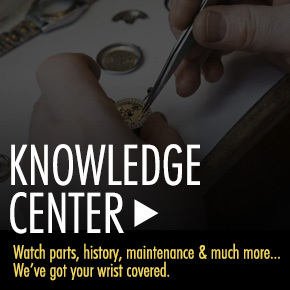 There’s no better time than now to resolve to select the perfect new watch for the New Year. What better way to kick-off 2017 than with an extraordinarily crafted timepiece on your wrist to celebrate both your accomplishments in 2016 and exciting new beginnings in the New Year. 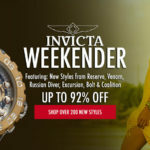 Many new arrivals from today’s top watchmakers have recently made their way to World of Watches, including styles from Rolex, Eterna, Frederique Constant, U-Boat, Salvatore Ferragamo, TechnoMarine, Michael Kors, Bruno Magli, Daniel Wellington, Invicta, Longines, Breitling, Alpina and more. 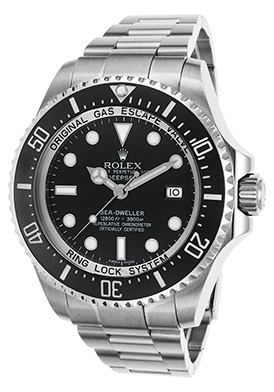 The Rolex Sea-Dweller Deepsea Automatic Timepiece is a superlative New Year’s watch choice for men. This exemplary crafted Swiss-made men’s timepiece is the quintessential diver’s watch with water-resistance to an astounding 3,900 meters or 12,800 feet. The contoured round case in polished premium grade stainless steel is presented on the handsome Oyster link bracelet in brushed premium grade stainless steel with a fold-over clasp closure and wet-suit extension. The unidirectional rotating bezel has a knurled edge rim and scratch proof Caerachrom top ring with engraved markers. The highly legible black dial features luminous pie-cutter hands, luminous cabochon dot and baton hour markers. Features include a built-in helium escape valve and a ring locking system. Additional features include a glare-proof scratch resistant sapphire crystal above the dial, along with a locking screw-down and case back. The Rolex Sea-Dweller Deepsea Automatic men’s watch is 44mm in diameter, 18mm thick and has been awarded official Chronometer certification from the COSC (Official Swiss Chronometer Test Institute). 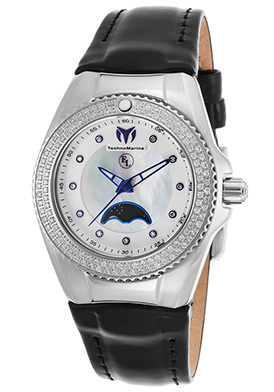 The TechnoMarine Eva Longoria Diamond Watch for women is a spectacular choice to ring in the New Year. Beset with glamour and brilliance, this dazzling women’s watch features a stunning array of 119 shimmering diamonds, pave-set to perfection on the perfectly round unidirectional rotating bezel in lustrous stainless steel. The contoured round case in premium grade stainless steel is highly polished to a mirror-bright patina. The supple black leather strap with distinctive stitched detail adds to the stylish good looks. The iridescent Mother-or-Pearl dial shines with a moon-phase window above the 6 o’clock hour, skeleton sapphire blue hands and eleven sparkling diamond hour markers. Features include a scratch resistant Flame Fusion crystal above the dial, quality quartz movement inside, along with a screw-down crown and case back for water-resistance to 200 meters or 660 feet. The TechnoMarine Eva Longoria Diamond women’s watch is 34mm in diameter and 13mm thick. The Frederique Constant Slimline Automatic watch is a classically elegant selection for men… ideal for the New Year and future ones to come. This timeless traditional Swiss-made men’s watch features the contoured round case in rose gold-tone ion-plated stainless steel in a highly polished finish, presented on the handsome crocodile-textured brown leather strap. The attractive black dial features an open-heart window below the 12 o’clock hour, rose gold-tone baton hands and hour markers. An exhibition skeleton case back lets you see the intricate Swiss-made automatic movement inside. Features include a scratch resistant sapphire crystal above the dial, a 42-hour power reserve and water resistance to 30 meters or more. 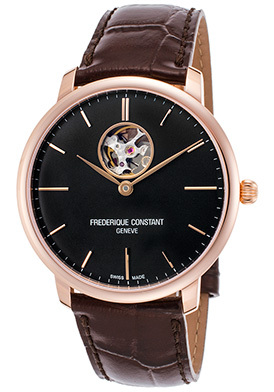 The Frederique Constant Slimline Automatic men’s watch is 40mm in diameter and 9mm thick. Pretty dazzling in pink, the Salvatore Ferragamo F-80 Diamond Watch for women is ultra-chic, at the fashion forefront and just right to kick off the New Year. This exquisitely crafted Swiss-made women’s watch features the round contoured case in brushed and polished premium grade stainless steel, presented on a highly attractive pink rubber strap with decorative cut-out detail and a push-button clasp closure for added security and convenience. The polished rose gold-tone stainless steel bezel with fluted detail adds striking contrast on the case. The stationary bezel with decorative screw accents surrounds the metallic pink dial with luminous sword hands and shimmering inlaid diamond hour markers. Features include a scratch resistant sapphire crystal above the dial, premium Swiss-made quartz movement inside and water-resistance to 50 meters or 165 feet. 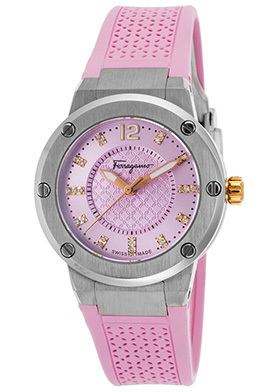 The Salvatore Ferragamo F-80 Diamond Watch for women is 33mm in diameter and 9mm thick. The Movado Thin Classic Chronograph offers sleek and flowing contours for men and is an ideal choice to go lightweight in the New Year. The perfectly round, ultra-slim case in polished stainless steel is presented on the attractive multi-link bracelet in brushed stainless steel and polished yellow-gold tone stainless steel accent links. The polished yellow gold-tone stainless steel bezel surrounds the metallic silver-colored dial with three sub-dials, yellow gold-tone sword hands, baton hour markers and the signature yellow gold-tone Movado concave dot at the 12 o’clock hour. Features include an automatic date window, 1/10th of a second, small-second and 30-minute countdown timers. 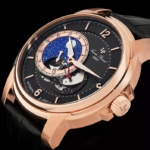 Additional features include premium Swiss-made quartz movement inside, a scratch resistant sapphire crystal above the dial and water-resistance to 30 meters or 100 feet. 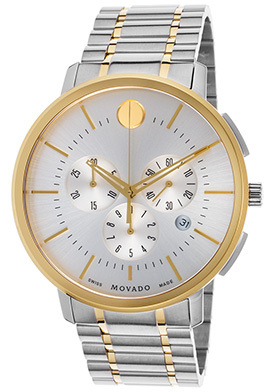 The Movado Thin Classic men’s chronograph is 42mm in diameter and 10mm thick. You’re certain to arrive fashionably on time with the Michael Kors Bradshaw Chronograph on your wrist. This trend-setting women’s watch features the attractive round case and matching multi-link bracelet in stainless steel, highly polished to a lustrous glow. 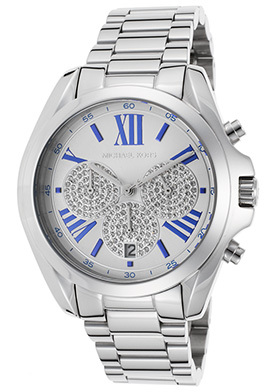 The silver-colored dial shines with three inlaid crystal sub-dials, polished silver-tone sword hands and raised blue Roman numeral and baton hour markers. Features include an automatic date window at the 6 o’clock hour, small-second, 30-minute and 12-hour countdown timers. Additional features include quality quartz movement inside and water-resistance to 100 meters or 330 feet. The Michael Kors Bradshaw women’s chronograph is 42mm in diameter and 12mm thick. New Year’s image courtesy of Wiki Commons. Seiko Clear Out: Top Seiko Styles At Close Out Prices.